Princeton University Press. Hardcover. 0691047871 Item in good condition and has highlighting/writing on text. Used texts may not contain supplemental items such as CDs, info-trac etc... . Good. Princeton University Press, 1991. Hardcover. Good. Disclaimer:A copy that has been read, but remains in clean condition. All pages are intact, and the cover is intact. The spine may show signs of wear. Pages can include limited notes and highlighting, and the copy can include previous owner inscriptions. At ThriftBooks, our motto is: Read More, Spend Less.Dust jacket quality is not guaranteed. Princeton University Press, 1991. Hardcover. Very Good. Disclaimer:A copy that has been read, but remains in excellent condition. Pages are intact and are not marred by notes or highlighting, but may contain a neat previous owner name. The spine remains undamaged. The dust jacket is missing. At ThriftBooks, our motto is: Read More, Spend Less. Princeton Univ Pr. Used - Very Good. Former Library book. Great condition for a used book! Minimal wear. Princeton Univ Pr. Used - Good. Shows some signs of wear, and may have some markings on the inside. Princeton University Press, 1991. Book. Very Good+. Hardcover. Book has lean. No jacket..
Princeton Univ Pr, 1991-04. Hardcover. Good. Princeton University Press, 1991-03-21. Hardcover. Like New. NICE CONDITION SOFTCOVER BOOK. NO WRITING OR MARKINGS IN TEXT. ONLY SLIGHT WEAR TO COVER. A CLEAN & SOLID BOOK. Princeton NJ: Princeton University Press, 1991 304 pages. 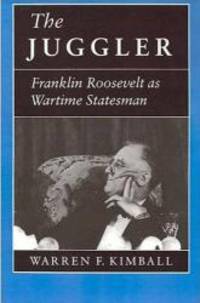 This book "explores Roosevelt's vision of the postwar world by laying outu the nature and development of FDR's 'war aims'--not his military strategy but the longer-range political goals he thought practical and desirable for the United States." Slight darkening near top edge of back of dust jacket. Dust jacket in mylar protector.. Hard Cover. Near Fine/Near Fine. 6 1/2 x 9 1/2". Princeton, New Jersey: Princeton Univ. Press. Very Good with no dust jacket; Dj in Good Condition. 1991. Hardback. 0691047871 . 304 pages . Princeton University Press. As New in Very Good+ dust jacket. 1991. First Edition. Hardcover. 0691047871 . Minor dust jacket wear; in new mylar cover ; 320 pages . U.S.A.: Princeton University Press, 1991. Clean and bright in sound binding. Faintly scuffed covers else fine, trade paperback. . Third Printing. Soft Cover. Fine. 8vo - over 7¾" - 9¾" tall. 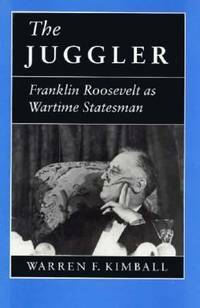 The Juggler: Franklin Roosevelt as Wartime Statesman. Princeton University Press, 1991. Hardcover. Ex-library, o/wise good (no markings to text) in dj. 304pp. ISBN 0-691-04787-1. .
Princeton Univ Pr, 1991-04-01. Hardcover. Used:Good. Princeton University Press. Hardcover. 0691047871 Like New Condition. . Fine. Princeton University Press. Hardcover. 0691047871 New Condition. . New. 1991-04-09. Good. Ships with Tracking Number! INTERNATIONAL WORLDWIDE Shipping available. May not contain Access Codes or Supplements. May be ex-library. Shipping & Handling by region. Buy with confidence, excellent customer service!